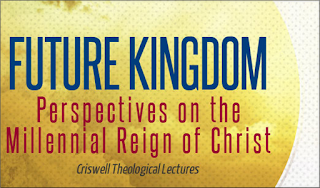 The Criswell College in Dallas, TX is holding a conference on the Future Kingdom: Perspectives on the Millennial Reign of Christ. It is part of the annual Criswell Theological Lectures. The event will be held on October 12, 2012, from 10 AM - 4 PM on the Criswell campus. Speakers include Craig Blaising, Craig Blomberg, Greg Beale, Kenneth Gentry, H. Wayne House, and Don Preston. The cost of the conference is: $30.00 for the general public, $20.00 for Criswell alumni, and $20.00 for students. Attendees must register by October 9 to reserve lunch. Registration at the door is possible, but lunch is not guaranteed. To register, RSVP to Evie Cozart at ecozart@criswell.edu or by clicking the online link here.